Arab rabbis stand behind mayor after Litzman declares war on city claiming it embitters haredi population's lives. 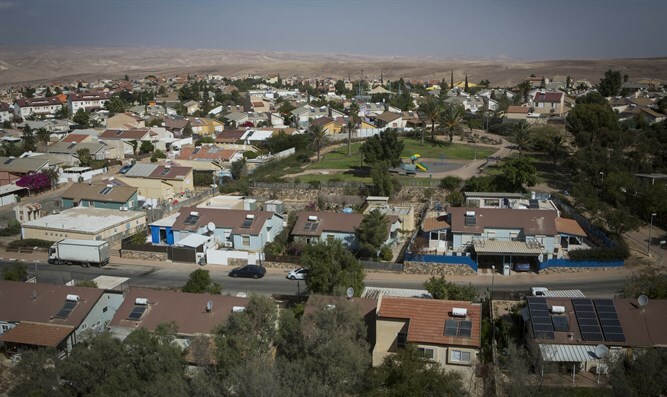 Arad rabbis expressed support for their mayor, Nisan Ben-Hemo, after Health Minister Yaakov Litzman (UTJ) declared war on the city claiming it embitters the lives of the local haredi community. On Tuesday evening, Ben-Hemo welcomed into his office Arad's Chabad, Sephardic, National-Religious, and haredi rabbis. The only rabbis not present were those representing Arad's Gur haredi-hasidic sector. The other rabbis said the Gur community is fighting the mayor, and Litzman, as a Gur hasid, has chosen to join the fight. Litzman has asked citizens to stage a protest against what he calls "severe injury to the Gur synagogue in Arad" as well as the municipality's behavior towards the local Gur hasidim. During Shabbat (the Jewish Sabbath), secular activists entered the synagogue being used by the Gur community, and eye witnesses reported acts of provocation. According to Litzman, Arad suffers from a high rate of "anti-Semitism supported and backed by the city's government." Litzman also emphasized the importance of not involving politics in the matter, since the mayor is a member of the Yesh Atid political party. He said the focus needs to be on "the severe injury caused to the Gur synagogue this past Saturday, by secular activists and residents of Arad who were brought to the synagogue by force in order to provoke and to desecrate the Shabbat's holiness." "The synagogue has always been a protected place, where no one who hates religion may tread. This provocation is a red line which we must raise a ruckus about. We cannot continue our day. We must organize protests all over Israel, obviously after we have received the blessings of our rabbis and the great Torah scholars of our generation, whom we will ask before taking any further steps." Yesh Atid chairman Yair Lapid said in an interivew with haredi news site Bhol that any member of Yesh Atid who was involved in the provocations will be immediately removed from the party. "I gave a direct order - anyone who participates in the desecration and provocation of a synagogue will be thrown out of Yesh Atid immediately," Lapid said. "We will not tolerate such people and such evil actions among us. If anyone disobeys this order, I will throw him out of Yesh Atid immediately." This is not the first time Gur hasidim have made a fuss about the synagogue. Previously, Gur hasidim attempted to forcefully take control of the Ashkenazi synagogue which had merged with the local Chabad synagogue. Police were ordered on a Saturday morning to detain violent Gur hasidim. At the time, secular Jews commented to Arutz Sheva that Chabad were peaceful and in line with the State of Israel, and feared the peaceful relations in the city would end if Gur managed to wrest control of the main Ashkenazi synagogue.